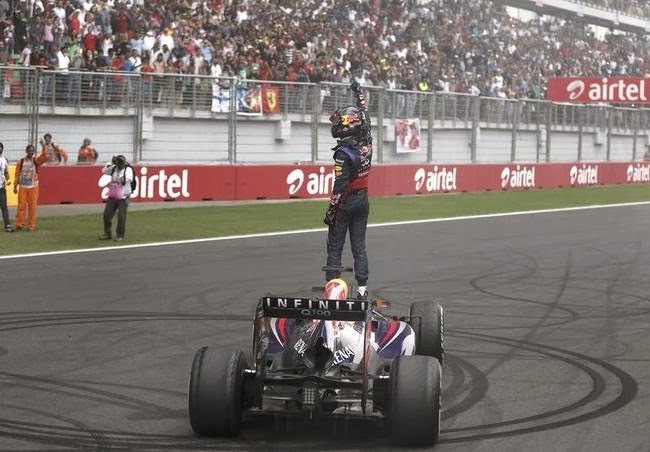 NEW DELHI - In a topsy-turvey strategy led race, Sebastian Vettel once again won by a big margin to become a four time World Champion emphatically. Its no good, I just can't shake it off. That feeling I get as the cars come round the last corner and slowly line up on the grid awaiting the red lights to disappear. Goosebumps, butterflies and hairs standing on the back of my neck in anticipation of what is to follow, that feeling never seems to leave me and is why I love this sport so much. That feeling was palpable amongst the crowd who had flocked to the Buddh International circuit. 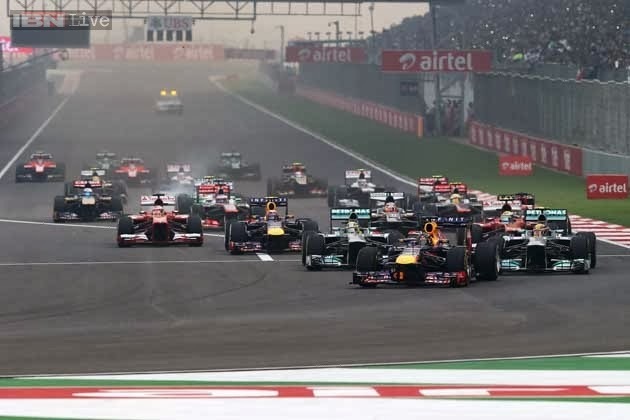 They had come to witness something special on what was the third and last Indian Grand Prix for the foreseeable future. They certainly got their reward today. Off the start line Lewis Hamilton got a great start and passed Rosberg, as Webber and Alonso have a little coming together going into turn 1 resulting in the Spaniard having to pit early for a new front wing. Down the back straight they charged and while Rosberg attempts to pass Lewis, Felipe Massa lunges down the outside with a huge turn of speed and overtakes both the Mercedes' in one go! Meanwhile Vettel opens a small gap back to Massa and at the end of the first lap the running order was VET, MAS, ROS and Ham in 4th. Vettel pitted early on the second lap getting rid of his softs for a set of primes.As he did so, Massa took the lead and for the first time in the 3 race history of the Indian GP another driver other than Vettel led the race! His motivation being signed up for a top seat in next years championship something to do with it?! As the race progressed various tyre strategies played out. One of the big winners was Romain Grosjean, one of the losers was Lewis Hamilton. Lewis found himself defending in the early stages and attacking Massa later in the race which would damage his tyres and eventually finishing 6th. Credit to Grosjean as he was able to make key overtakes at critical times to work his way up and finish on the podium from 17th at the start! Webber looked strong before an alternator problem meant that he had to stop his car out on track on lap 40. Amazing how it's always the popular Australian's car that suffers all the terminal problems! Ultimately the day belonged to Sebastian Vettel, as he crossed the line he was some 30 seconds ahead of Nico Rosberg who finished 2nd. Quite rightly he took his time on the slow down lap wrestling with his emotions. As he approached the last corner he went past the pit lane entry and cruised up to the start line and did some doughnuts before standing atop his car and saluting the crowd and his own achievements. Brilliant. He now joins Schumacher, Prost and Fangio as 4 time World Championship winners. As Sebastian stood on his great car saluting the crowd those feelings returned to me once again, butterflies, goosebumps and a huge lump in my throat. Congratulations Sebastian Vettel, 2013 Formula One World Champion! Those feelings will never leave me while we have special days like today. Days when we see a good driver become one of the sports greatest ever competitors. On the podium, Sebastian talked about how he dealt with the boo boys, his answer to them was to put in an even better performance the next time he got into his magnificent Red Bull racing car. That is the mark of the competitor and the mark of the man. 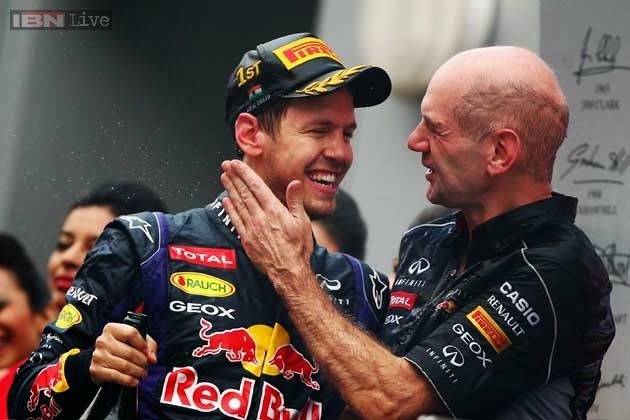 This was always going to be Sebastian Vettel's day. Maybe now those that have booed should start recognizing we are witnessing one of the sports all time greats. Full race report for the 2013 Indian Grand Prix. Sebastian Vettlel clinched his fourth World title.